When it comes to home styling, there's nothing more daunting than pulling a room together with the right interior buys. Like our wardrobe, we can find ourselves playing it safe with classic neutrals and muted tones wishing we were brave enough to venture into a rainbow of unchartered territory. Luckily, there are plenty of ways to introduce zesty yellows, bright blues and gorgeous green tones into your home without breaking a sweat (or your budget). Heal's new spring collection is bursting with fresh hues and minimal aesthetics, each designed to compliment one other, meaning you can't go wrong with your selection. 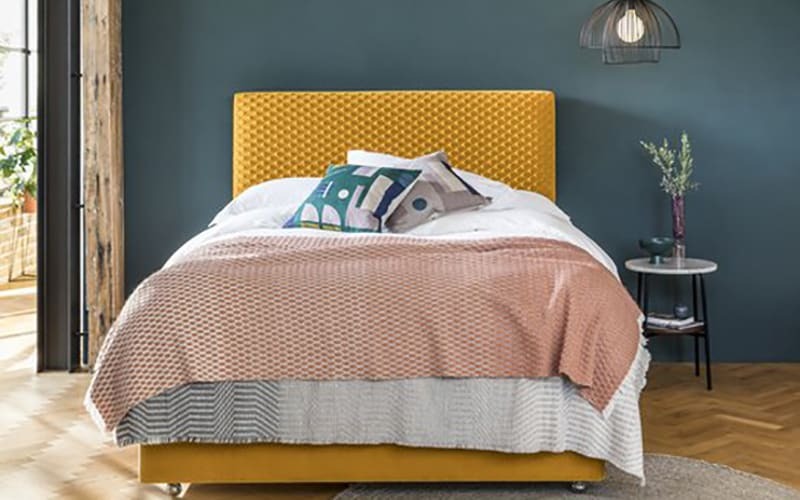 Whether it's a citrus-toned headboard teamed with a blush pink throw or a mismatch of multicoloured bowls to amp up your table setting, they have you covered. But, if you do need a little push in the right direction, Heal's Interior Planning Service at Westfield London's Home Quarter is a great way to gain a bespoke design for your space. The expert interior planners work in collaboration with each customer, from initial conception of the design to handpicking each fabric, colour and finish, finally bringing the plans to life through effective project management. In the meantime, this is how you can inject a splash of colour into your home like a pro. If jumping into a sea of colour feet first is too much of a commitment in the beginning, start small. A red ornament, pink vase or orange book is enough to add a hint of colour into a space without having to change your entire room. Starting with a neutral base is a great way to play around with colour and get comfortable with how to use it and where it can be placed. Heal's vase collection is a fantastic place to start to add a touch of the new season into your home without going overboard. A house full of colour is enough to make any newcomer run for the hills, but homeware has come a long way from just being about bold prints and neon brights. While most of us consider colour as a scary notion, it can be very subtle when done carefully. Think blush pink, sage green or baby blue – all shades that are not only on-trend for the new season, but can add a very soft hint of colour to your home. The best way to start using colour is to remember that it can also be temporary. If painting the walls a strong shade of magenta is a little too much, start by opting for a colourful throw, a new terrazzo-style rug (very now!) or striped cushion covers (Heal's pink Form Cushion is a perfect option) – all temporary accents that can be changed and updated according to your mood and season. You don't need to get a paintbrush out to add colour to your walls – let someone else do it for you! Heal's have a huge collection of beautiful artwork suitable for all room sizes and colour schemes. Whether it's a hanging Laurie Maun print or a Mark Rothko (the king of colour) composition, it adds a cultural sophistication to your interiors without having to overhaul your space.